The MountainWest RubyConf 2008 is upon us just 2 weeks away in Salt Lake City, Utah. Unfortunately I'm not going to be able to be there given my travel with The Code Trip. IronRuby, however, was able to be a sponsor of this year's conference as a Gold Sponsor. This sponsorship is one part that enables video production of the conference for afterwards as well as a few other things. The organizers have done a great job getting great sponsors to make this happen, and IronRuby is grateful to be a part of that. 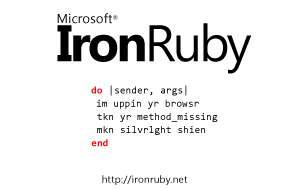 I've been clamoring to get some Ruby in my Silverlight for a while and hope to post some samples of that scenario of using IronRuby in Silveright and Ruby on Rails on the server...anyone got a scenario that is common that you may want to see?